Yoga is not just stretching. Yoga is not religion. Yoga is a way of life and quality of life. Yoga is an ancient science and practice, which originated in india over 5,000 years ago to address physical, mental, spiritual development. Practice yoga through ASANA (postures), PRANAYAMA (breathing) and MEDITATIONS (mind control). It can help weight control, can improve health and beauty. so "LOVE YOUR-SELF, LOVE YOGA. by Tendy Yoga"
Yoga can be done 2 hours after a light meal and 4 hours after a heavy meal. Please turn your mobile phone off or vibrate mode, and remove your shoes before entering to studios. Put them in the shoe cabinet Try to drink more water before / during and after yoga class. To help purifly the body.by the entrance. Wear comfortable clothing. For instance, Yoga Outfit / Stretcherble Pants / T-Shirt. No shoes and socks while practicing yoga. Never strain or force your-self into a postures. Just listen to your body. 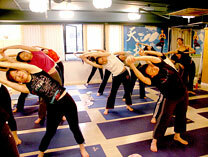 If you are suffered from sport injuries or women who are menstruation or preganat should avoid certain postures. Please inform teachers before class. The sound of OM is not religion, is the sound of the univers and you. It gives you more PEACE OF MIND AND HORMONY. "YOGA BRINGS INNER BEAUTY OUT AND YOUR EYES, BODY SHINES LIKE DIAMONDS. SMILE AND HAPPY LIKE A LOTUS FLOWER WITH THE PRACTICE OF YOGA."